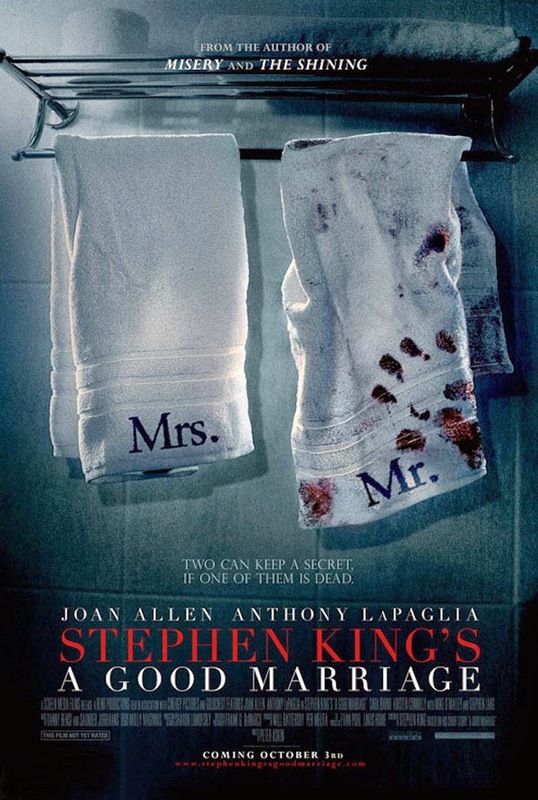 The latest entry in Stephen King's movie-adaptation repertoire is "A Good Marriage," based on the short story from King's 2010 collection "Full Dark No Stars." Dread Central gave us a look at the poster and trailer for the upcoming movie earlier today. The tale of "A Good Marriage" is, in the grand scheme of things, a study on how we truly don't know who we are married to-could the person we sleep next to at night with trust and abandon be a straight-up serial killer? In this case, yes. But the true story lies in with what happens when the wife discovers her husband has been operating as a serial killer for the better part of their twenty year marriage. Anthony Lapaglia and Joan Allen star as husband and wife in "A Good Marriage" and you can catch the flick in limited release and Video on Demand on Oct. 3.